I grow weary of technical terminology. I love World War I poetry in English, and thought that I would look at some in French. 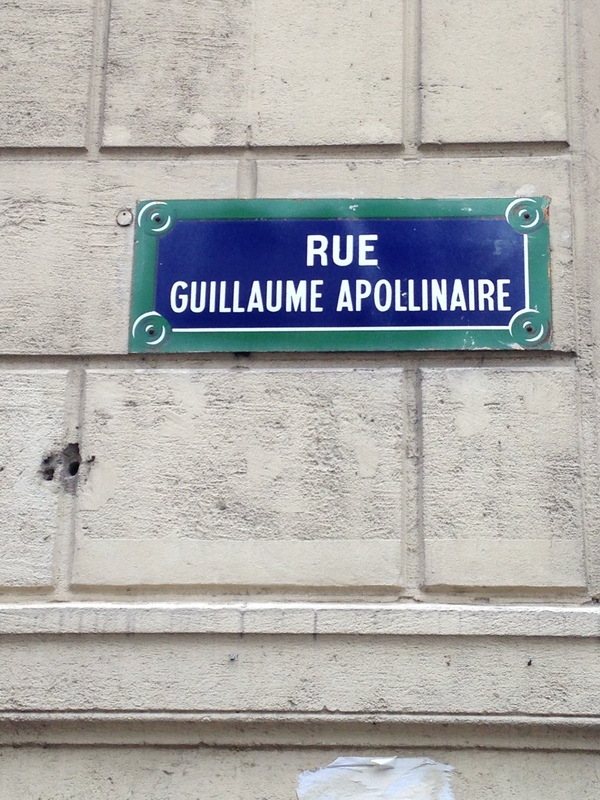 Guillaume Apollinaire was a (very) famous French poet who fought in the artillery and in the trenches in WWI. He suffered a head wound in 1916, never really recovered from it, and in his weakened condition, died in the influenza epidemic of 1918. Here is one of his poems, Exercice. At conferences in my professional field, the number two topic of conversation over beers is how poorly funded scientific research is in the United States right now. The number one topic of conversation is complaining about our reviewing loads. Reviewing papers is one of the constant burdens in academia, but you don’t want to say no to a request to review, as being invited to review papers is one of the things that marks your transition into a fully-functioning professional. So, we all have constant requests to review conference papers, journal articles, grants, book chapters, book proposals, books—on and on. Voici un article à relire pour la JE ATALA Ethique et TAL. Vous avez jusqu’au 20 octobre pour m’envoyer votre retour (accepté ou non, avec un commentaire). Les articles ne sont pas anonymes, mais votre relecture le sera (vous êtes deux relecteurs par papiers). relire: normally, this is to reread, read over, or to proofread. Here it is “review,” in the sense in which we use that word in academia—to read and provide an assessment. le retour: basically, return—but, in this case, it’s an event that is the argument of another event—pour m’envoyer votre retour. la relecture: normally, this is a rereading, proofreading/editing/revision, or a reinterpretation. In this case, it’s a review in the academic sense—your assessment of the submission. One of the fun things about today’s words is that they’re phonetically quite interesting. Note the high front rounded vowel in relecture and the mid front rounded vowel in relecteur, both of them before r—these are words that will basically be impossible for an American (like, say, me) to pronounce. Another fun point is that the e after the initial r in all of these words can be deleted in the spoken form (click through to WordReference.com for the transcriptions), leading to an initial rl cluster—if you think that the French r is tough for Americans to pronounce, try putting it in a consonant cluster! What is the function of the le in votre relecture le sera? Note the use of par to mean “per.” In a previous post, we looked at the use of par to mean “by”—here we have another sense. You might be wondering how you could possibly review an article that’s not written in your native language. In fact, scientific papers are routinely reviewed by non-native speakers, at least in English. It’s the international language of science today, and many reviewers are not native speakers. Without these non-native-speaker reviewers, the system couldn’t possibly handle the strain of the amount of reviewing that needs to be done. la faille: a flaw or loophole; in geology, a fault or rift. 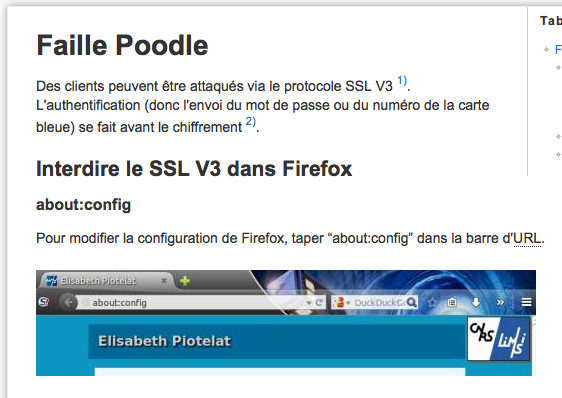 Hier a été révélée une faille de sécurité de SSL v3 qui affecte principalement les postes clients (bref, votre ordi) et pourrait permettre à un attaquant (au hasard entre votre ordi et votre banque) de vous forcer à utiliser ce protocole SSLv3 pour récupérer quelques informations intéressantes sensées être cryptées (mot de passe, code de carte bleue). le poste client: this one has engendered a lot of chat on translation fora (forums?). The consensus is that depending on context, it can be either a workstation or a client (in the computing sense of that term). more distant, such as “recenser”, or of a higher register (“censément”). The horse is being gentle with her rider. You’re being so angry again! * John is being tall today. * Aren’t you being beautiful tonight! * Stop being so intelligent. So, why the de in front of plural nouns that have prenominal adjectives? I have no idea. The interesting thing to me is not so much the specifics of the rule (use de, not des, in front of a plural prenominal adjective) as what it suggests about the representation that underlies the rule, the qualities that the language has to have in order for a rule to be able to make reference to those qualities: in this case, something like the distinction between inherent versus non-inherent or necessary versus accidental qualities. One of the major trends in my field today is the use of Amazon Mechanical Turk (AMT) to create linguistic resources, particularly for natural language processing. Using AMT, tasks that require human intelligence—for example, deciding which synonym of a word is being used in a particular context, or labeling a photograph with the things that it pictures, or deciding whether or not a web page is relevant to a search query—are given to humans in very small increments, usually with the goal of using the humans’ data to train a computer to do the same task. It is a form of crowdsourcing—using the public to do a (typically large) job in (typically) small amounts, e.g. Wikipedia. ▪ une ombre: shade, shadow. ▪ la zone d’ombre: gray zone. ▪ le vaut bien: to be worth it. ▪ la foule: crowd, mob, masses. ▪ le travail parcellisé: microworking. ▪ découpé: cut into pieces. That’s ten words just to get to slide 10 out of 30, but that’s about all I can handle in a single day—more Zipf’s Law words next time. The lines represent growth in the number of word types as increasing numbers of tokens are observed. The blue line (BNRC) is unrestricted Bulgarian text. The red line (epicrises) is Bulgarian clinical documents. 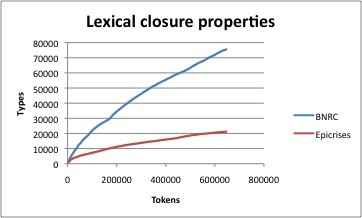 The clinical documents show lexical constraints–for a given number of tokens, the number of word types is much smaller, and tends toward finiteness. I had to look up all of these words today in order to be able to explain just one aspect of my research. One of the things that I work on is the topic of sublanguages (explained below). Looking for material on the subject in French, I came across the doctoral dissertation Sur la notion de sous-langage, by Roland Dachelet. Even in the context of discussing my own research, Zipf’s Law strikes. le domaine: domain. A sublanguage is a variety of language associated with a specific domain—medicine, biology, weather, sports reporting. spécialisé: specialized. Being related to a specific domain, a sublanguage is specialized. la contrainte: constraint. Sublanguages are generally associated with constraints—constraints on the kinds of subjects and arguments that a verb in the domain can have, for instance; constraints on syntactic structures; constraints on the set of words. le lexique: in this case, the set of words in a text—vocabulary. It has other meanings, too, such as bilingual dictionary. Typically the set of words in a sublanguage is constrained. la morphologie: morphology (how words are put together). une ambiguïté: ambiguity. The fundamental problem of language processing—if most things in language didn’t have multiple possible interpretations, computers could just look everything up. la variabilité: variability. The other major problem of language processing—there are so many ways to express the same thing. la caractérisation: characterization. The current challenge in sublanguages is to characterize them automatically—that is, with a computer, as opposed to a human doing it manually. la syntaxe: syntax. This is how phrases are structured. une analyse syntaxique: syntactic analysis. la structure: structure. Syntax is mostly about structure. sous-jacent: below, underlying, implicit (the sense in which I need it). Important aspects of language, such as syntactic structure, are implicit in the sense that they are not visibly indicated in the stream of language.